The Blaine Harbor Music Festival (BHMF) is held annually in scenic Blaine, Washington, with views of the Salish Sea to the west, and the Cascade Mountains on the east. Our July festival brings world-class music educators and performance artists to Blaine to teach and mentor young musicians (aged 12–19) all week, and to perform for the community in noon-hour and evening concerts. The festival is organized each year by a dedicated team from the Pacific Arts Association in Blaine, Washington, a 501(c)(3) not-for-profit organization that is supported by the community and city of Blaine, as well as by grants from our supporters. BHMF’s Camp faculty are highly-qualified music educators and performers from some of the most prestigious music education colleges in the world. Bios for the BHMF instruction faculty can be found here. The music camp boasts a low ratio of students to instructors, resulting in a very meaningful educational experience for the music students attending. BHMF Camp offers music education across a wide spectrum of interests and genres. Camp program options can be found here. Each day of BHMF features live performances from the professional musicians who make up our instruction faculty. The Festival Week performance schedule can be found here. 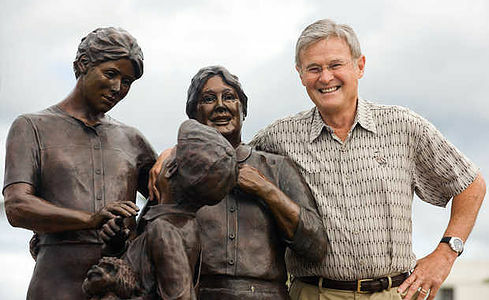 Bruce and Sandy Wolf led the fundraising efforts that brought the Vigil sculpture to G Street Plaza in downtown Blaine. The Pacific Arts Association now maintains the Vigil. Bruce Wolf dedicated his life to giving back to his community. The Bruce Wolf Endowment Fund celebrates his extraordinary life, his dedication to Blaine and his passion for the arts. It is a legacy. Your contribution to his Endowment Fund will help support the organization Bruce co-founded, the Pacific Arts Association.